It was the expected final, as the two best players of the year faced off to decide the title – on an epic duel regarded as one of the very best of the 61 finals Martina and Chris contested against each other. They had already competed on the Eastbourne decider a couple of weeks earlier, with Navratilova coming back from a 1-4 deficit in the third set and saving a match-point under extreme conditions on a gale-swept day. It was a huge morale booster, as the Florida native had won the six previous encounters between them. On the wind-protected Centre Court, Evert opted to start out in attacking fashion and grabbed the initiative, but couldn’t keep the momentum after the first set; Navratilova managed to fight back in the second and the third was an absolute thriller: Evert was 4-2 up in the deciding set, but Martina rallied and won 12 of the last 13 points of the match – holding at love the last two times she served and missing just one first serve. 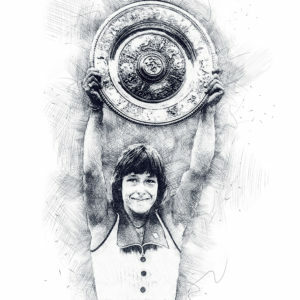 It was meant to be: fate determined that Martina would win her maiden Grand Slam singles title against her biggest rival at the place she would reign supreme, becoming world number one for the first time. Martina shed a flood of tears into a towel and confessed: “I thought I could win before the match, but I didn’t really believe that I could be the Wimbledon Champion. Most people thought Chris would win, but I came through”, said the new champion. “I don’t know if I should cry or scream or laugh. I feel very happy that I won, but at the same time I feel very sad I can’t share this with my family”. She had not seen her parents or her sister since defecting to the United States in 1975 – but her parents had seen this first major turning point in Martina’s career; they were not given permission to fly to England, but travelled close to the West German border to watch the final on German television. The rivalry between the pair went down in history as one of the greatest in sports and the statistics are eloquent: between November 1975 and August 1987, there were only 23 weeks during which one of the two did not top the WTA rankings – and from 1973 to 1988 they played a total of 80 matches, with Martina prevailing 43-37 head-to-head.